Carbon hole saws for wood doors, fits all interior and exterior doors, self centering jig fits all common door widths, adjustable for both 2-3/8" and 2-3/4" backsets. Includes: double sided jig, (2) carbon hole saws, 3/8" mandrel, bolt plate template, custom router bit, and hinge plate template. For use on wood doors. Includes: positioning template for marking hole location, drill guide for accurate pilot holes 2-1/8", hole saw blade for fast cuts in hard woods, 1" spade bit for drilling edge bores, mandrel 3/32", Allen wrench, 1" wood chisel, 5/32" pilot drill centering template. Bi-metal hole saws for metal and wood doors, fits all interior and exterior doors, self centering jig fits all common door widths, adjustable for both 2-3/8" and 2-3/4" backsets. Includes: double sided jig, (2) bi-metal hole saws, 3/8" mandrel, bolt plate template, custom router bit, hinge plate template. Drills clean, accurate holes in all entry door materials. Features large handle and tool free backset adjustment, lightweight die cast aluminum construction for durability, and easily converts from 2-3/8" to 2-3/4". 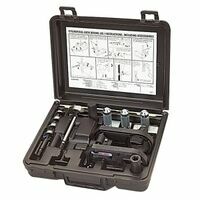 Includes: spade bit, multi-spur bit, replaceable mortise blades, 1-1/2" adaptor ring, strike locator tool, jig, and tool box.